We’re so pleased to announce Ted Dunagan’s A Yellow Watermelon, one of our distributed titles from NewSouth Books, has been named one of the 25 Books Every Young Georgian Should Read. The Georgia Center for the Book has compiled a list of 25 Books Every Georgian Should Read since 2002. It was revealed at a private party on August 26 at the Parkers on Ponce restaurant in Decatur, Georgia. If you find yourself in Decatur this weekend, check out the public announcement and book signing Saturday, August 28, in Decatur’s Historic Square from 10:00 am to noon. Find out more about Ted Dunagan and A Yellow Watermelon at NewSouth Books. Congrats to Ted and NewSouth for this accomplishment! What’s the buzz on Banktown? Our offices aren’t far from Charlotte, N.C., where two of the big banks involved in our national financial crisis–Wachovia and Bank of America–are headquartered. So we’ve been feeling the hit they took in 2008–and the hits that keep coming. And even if you aren’t near Charlotte, I bet you’ve been feeling it too. Next month, we’ll officially release Banktown: The Rise and Struggles of Charlotte’s Big Banks by Rick Rothacker. (And if you can’t wait for it to hit store shelves, the book and ebook are available at online booksellers now.) Had enough of the banking crisis, you say? Well this book is different. In it, you’ll get a glimpse into the blazing success and collapse of these two banks and the personalities behind them. As the Charlotte Observer‘s banking reporter for nearly a decade, Rick has had a front-row seat to the banking crisis as it unfolded. The ground-zero insights he reveals in Banktown take readers behind closed doors, allowing them to be flies on the wall during the handshake that sealed the merger of First Union and Wachovia and at the press conference at which Ken Lewis announced his retirement. Vivid details and anecdotes humanize the tale, from sleep-deprived bankers analyzing a $50 billion deal in less than 24 hours to Wachovia customers realizing that their mystifying adjustable rate mortgages resulted in their owing more after they made their monthly payments than before. With a cast of ambitious CEOs, brash traders, and powerful government officials, Banktownis poised to become the definitive account of how our national crisis played out in Charlotte and how its aftermath bruised the economy and the pride of one of the New South’s brightest skylines. Find details on Rick’s upcoming book signings here. You can also catch another Q&A with Rick, this time with the Wall Street Journal’s blog. Yesterday we posted about Carolyn’s trips to the balds of Roan Mountain. This following is an excerpt from her book Touring the East Tennessee Backroads, second edition published in 2007. It explains some of the theories and legends behind what caused the “balds” in the Roan Mountain area. Big Hump and Hump mountains are peaks along the Appalachian Trail, near Roan Mountain, that feature balds. For centuries, the 6,285-foot “bald” peak called Roan Mountain has been an area landmark not only because of its height, but also because of the distinctive appearance of its treeless summit. Generations of scientists have tried to explain why certain mountaintops in the 2,000- to 6,000-foot range in this part of the Appalachians will not support trees. Altitude and timberline are obviously not the answer, since nearby Mount Mitchell, at almost 7,000 feet, supports tree growth all the way to the top. In 1938, a professor from Louisiana State University advanced the theory that wasp eggs laid in the trees were responsible for killing them off. Unfortunately, his theory failed to explain why the infestation did not spread and why eradication of the wasps did not result in reforestation. A botanist from North Carolina State University suggested that Indians had created the balds by continually burning off the mountaintops for their settlements. But evidence from archaeologists and anthropologists showed that Indians pre­ferred valleys near streams and never chose the tops of ridges for their villages. As usual, when science fails, legend enters. In 1898, James Mooney recorded in his report to the Bureau of American Ethnology that the Cherokees had a mythological explanation for the origin of the balds. A Cherokee village was terrorized by a giant yellow jacket called Ulagu that swooped down, snatched up children, and quickly flew off into the distance. The ever-resourceful Cherokees posted sentinels on the tops of the mountains in order to track Ulagu to its lair, located in an inaccessible cavern. The Cherokees prayed to the Great Spirit for aid. Suddenly, a bolt of lightning split off the side of the mountain where Ulagu hid. The Indians then quickly fell on the monstrous insect and destroyed it. There once was a time when all the nations of the earth were at war with the Catawbas, and had proclaimed their determination to conquer and possess their country. On hearing this intelligence the Catawbas became greatly enraged, and sent a challenge to all their enemies, and dared them to a fight on the summit of the Roan. The challenge was accepted, and three famous battles were fought. The streams of the entire land were red with blood, a number of tribes became extinct, and the Catawbas carried the day. Whereupon it was that the Great Spirit caused the forests to wither from the three peaks of the Roan Mountain where the battles were fought, and wherefore it is that the flowers which grow upon this mountain are chiefly of a crimson hue, for they are nourished by the blood of the slain. The Catawba legend is particularly accommodating because it accounts for another characteristic that helps to draw thousands of visitors to Roan Mountain each year. On the top of the Roan, there are six hundred acres of natural rhododendron gardens that put on a brilliant display of color each June. In 1799, Scotsman John Fraser, under the patronage of the Russian govern­ment, made his third trip to the North Carolina-Tennessee mountains. It was during his journey up the Roan that he discovered a new plant, which he designated Rhododendron catawbiense. It is this plant, with its crimson-colored blooms, that attracts so many sightseers. Roan Mountain also boasts an 850-acre forest of Fraser fir and spruce. The Fraser fir, named after the same John Fraser who christened the Catawba rhododendron, has become the rage in the domestic Christmas-tree industry, spawning a whole new source of income for local landowners. With the start of the school year just around the corner, we thought we’d share with you one last vacation spot. Blair president Carolyn takes us on a trip to mountains on the North Carolina/Tennessee border–with, of course, her golden retriever Carmen. My husband Alton and I love to hike the grassy balds that straddle the border between Tennessee and North Carolina near Roan Mountain. 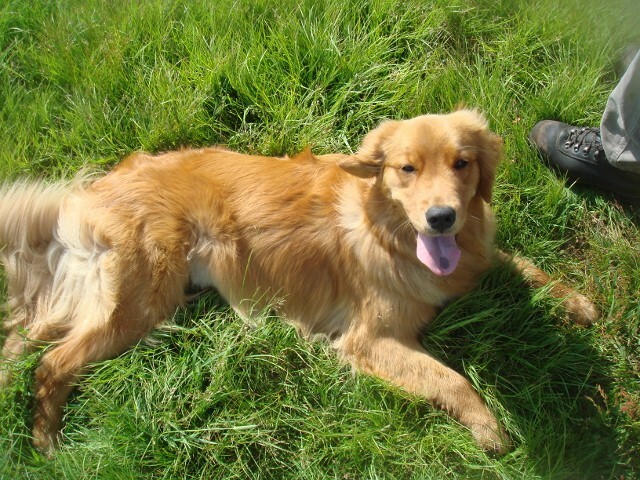 This summer, we introduced our one-year-old golden retriever, Carmen, to the Appalachian Trail (AT). We began our journey at the end of Roaring Creek Road in Avery County, where we followed the Overmountain Victory Trail to Yellow Mountain Gap. From the gap, near a barn-like Overmountain shelter frequented by hikers, we headed up Yellow Mountain on the AT. Our destination was the summit of Little Hump Mountain. Over the years, we’ve discovered a little-known side trail that allows us to loop back to Roaring Creek, but this trip we had to do some serious bushwhacking to get around trees that fell across the trail during this past winter’s serious ice storms. Despite these obstacles, it was a perfect day for a hike. And Carmen adapted readily to maintaining trail formation between the leader, Alpha Dog Alton, and me, bringing up the rear. We also went to another spot on the AT called “the Hump” or Hump Mountain. Hump Mountain is the northern end of what is called the Roan Highlands. From here, you can see Grandfather Mountain, Table Rock & Hawksbill, Grayson Highlands, and over into Tennessee. On this second trip, we hiked up from the Tennessee side along Shell Creek, heading toward Doll’s Flats. Although this nice trail traveled alongside the cascading creek for much of the route, it eventually climbed straight up for elevation gain of about 2,000 feet. Whew! Although it was 90 degrees in the valleys below, we had to don our jackets because of the strong winds on top of the Hump. If you’d like to read more about the balds and Roan Mountain, check back in with us tomorrow for an excerpt from Touring the East Tennessee Backroads. You can find directions to these hiking spots and more in the book as well. Happy Friday, readers. I figured I’d leave you with an uplifting story from our friends at KaBoom!, a non-profit organization dedicated to created great play spaces for children around the United States. After Hurricane Katrina destroyed much of communities along the Gulf Coast five years ago, KaBoom! went in and helped folks in the area rebuild their community parks. The following is a repost from KaBoom’s blog, written by Sarah Pinsky. It’s an inspiring look at the positive side of the Katrina story five years later, and it shares how Kathleen Koch was involved in their projects. “Don’t give up. No matter what.” That’s the lesson Kathleen Koch wants readers to take away from her book, Rising from Katrina, a poignant account not only of the city of Bay St. Louis’ recovery following Hurricane Katrina, but that of the author herself. A correspondent for CNN at the time, Kathleen was actually covering the story of Hurricane Katrina on the Alabama coast when the eye of the storm came ashore in Waveland, Mississippi on August 29, 2005. Kathleen grew up in Bay St. Louis and maintained close ties to the small Gulf Coast city even after moving to Washington, DC. Eager to check on friends and family living in the path of the hurricane, she made her way to her former hometown only to discover it was completely devastated by the storm. As Director of Operation Playground for KaBOOM!, I spent a lot of time in Bay St. Louis and along the Gulf Coast as we fulfilled our promise to build 100 playgrounds in the areas affected by Hurricanes Katrina and Rita. I was in awe of the people I met, how they could handle such horrible circumstances with so much grace, perseverance, and optimism. Kathleen provides a window into so many lives impacted by the storms in her book. They’ll make you cry; they’ll make you laugh. They’ll inspire you. The time I spent in the Gulf was the hardest but most rewarding of my life. After each visit I was even more convinced that our work was a critical piece of the recovery effort. The children desperately needed places to shake the reality of the devastation. They needed to run, laugh and play and to remember what is was like to be kids again. KaBOOM! built four playgrounds in Bay St. Louis, including both our first and 100th. The book is a moving testament to the strength of the people who live there and a valuable reminder to us all not only of our own hidden strength but also the power of community. Kathleen reminds us that while scores of volunteers from across the country helped rebuild the coast, at the core were neighbors helping neighbors, just as we see at our playground builds. We were honored to have Kathleen volunteer at one of our builds and even more so that she chose to highlight our work in her book. I can still remember watching her mix concrete at what was then called Murphy-Gulfview Elementary School in Kiln in October, 2006. She worked harder than anyone that day, moving from one task to another, smiling all the while. This August marks the five year anniversary since Hurricane Katrina devastated the Gulf Coast. There has been remarkable progress in the last five years but so much remains to be done. We’ve built 134 playgrounds and will build 8 more this year. Our commitment is unwavering and we’re so grateful to the partners who have joined us in this effort. There are lots of books available that describe Hurricane Katrina and the aftermath. But for me, Rising from Katrina is much more. It’s a story about the triumph of the human spirit; how individually and collectively we can overcome even the most challenging odds and pull together to create positive change. We can all learn a lesson from Bay St. Louis. This month marks the five-year anniversary of Hurricane Katrina’s crushing landfall. The people of the Gulf Coast lost everything in the storm’s path–houses, bridges, even complete towns were leveled. 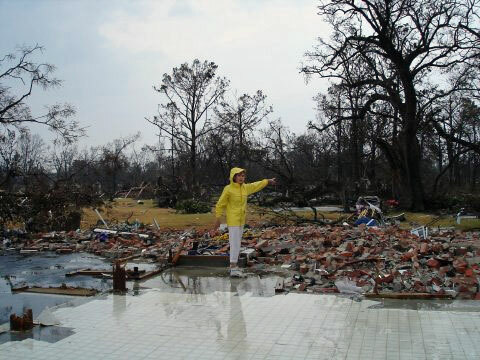 Kathleen Koch was in Mobile, Alabama, to cover Hurricane Katrina for CNN. After the hurricane had passed, the CNN team made their way to Bay St. Louis, Kathleen’s hometown. They made their live reports when they had to, but when the cameras turned off, they rolled up their sleeves and did as much as they could to help. If you’d like to attend any of her signings, find full tour details here.